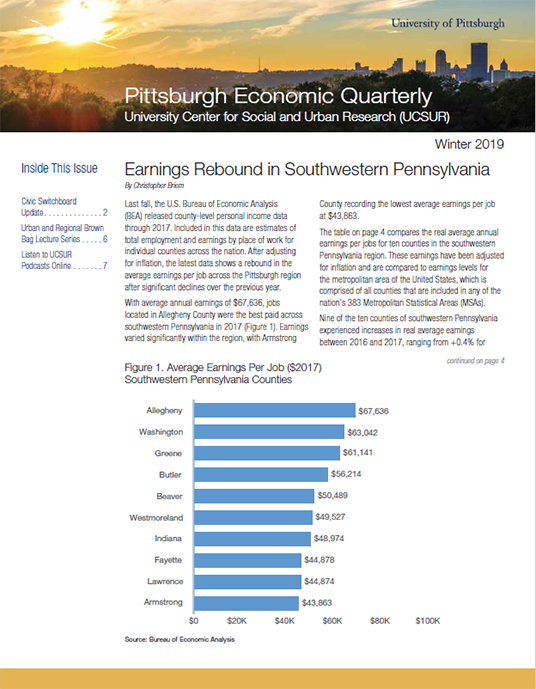 UCSUR publishes the Pittsburgh Economic Quarterly (PEQ) to support organizations and staff involved with economic development throughout the region. PEQ highlights important economic and demographic trends that impact the regional economy and the competitiveness of the regional economy. PEQ is an extension of the continuing work done at UCSUR. Each issue includes the latest data on regional employment and economic conditions. Feature articles cover a variety of issues relating to the regional economy and how it is changing along with analyses of other economic and social factors that directly impact the future of the region. A significant number of positive responses to PEQ have resulted in substantial press coverage, and the publication has filled a major need in the region for the ongoing study of current economic trends. Recent issues of PEQ have addressed change in the city of Pittsburgh, lead in drinking water, the role of libraries as all-purpose education hubs, the use of 311 requests as a measure of conditions in city neighborhoods, and trends in mining employment and industry in Pennsylvania.